As we packed 100+ Crawlers into Boomtown Coffee in The Heights for the first portion of the sold out Houston Caffeine Crawl, Matt and the Boomtown team divided the groups up in three parts to watch a roast cycle and touch on the nuances of the roasting process*. The other demonstrations were a Kalita brew demo and a chocolate demo outside with Scott of Tejas Chocolate sharing about the bean to bar process (samples included) in the beautiful 70 degree weather. Many of the Crawlers hovered around the beautiful Stella di Caffe espresso machine (custom for Barista Nation) and drank espressos. Groups rotated through the three setups, then gathered their burlap Wholesome Sweetener bags full of additional treats and embarked on their routes. Route guides were Crystal Reyes and Josh Burdett of Perfect Crema Sponsor InterAmerican Coffee, and Kent Baker and Jason Burton of Crawl creator and creative firm The LAB. Other participating shops included Blacksmith, Catalina Coffee, Double Trouble Caffeine and Cocktails, Eatsie Boys, Paper Co. Coffee, and Southside Espresso. Paper Co. Coffee, located in the beautiful Ecclesia Church, sampled their chicory cold brew and had a local food truck on hand. Their roaster, Mueva Coffee, spoke to the groups about their operation and family history in the coffee business. Crawlers received a packaged cookie and three lucky winners took home a custom illustrated bag of coffee. David Buehner of Blacksmith and roaster Ecky of Greenways Coffee Roasters were on hand to greet each stop and share samples of their housemade drinking coffee yogurt. This was the first time drinking yogurt has been on a Caffeine Crawl and it was quite popular. Neighboring shop Southside Espresso also brought something new to the Crawl with their jalapeño and ancho chili macchiatos using a housemade syrup. They also had a pairing and tasting flight available to the groups for a discounted price. 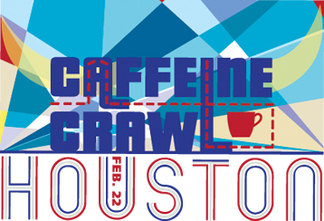 There aren’t many cities in the country where we could host a Crawl in February and Crawlers would enjoy cold drinks so much, but Houston can certainly pull it off! Catalina Coffee treated all their stops to a bottled Kyoto brew and a bag of espresso--quite a treat! As many opened their Kyoto brew and started sipping, Amaya Coffee owner and roaster, Max, shared his info about his coffee buying trips and the process from origin. Two shops incorporated coffee-inspired booze: Robin B. of Double Trouble Caffeine & Cocktails was assisted by Candace, also a Greenway roaster, in serving a housemade kahlua-inspired liqueur mixed with a Greenway cold brew, and Eatsie Boys brought out some of their partners and shared two different takes on coffee. Locally owned Caphin served their bottled Vietnemese cold-brew, and Ryan of Eatsie served their Rocket Fuel coffee porter by 8th Wonder Brewery. Houston (and Austin) coffee lovers had no fear of showing their love and support for this first time event in the state of Texas. After such a creative, fun event, we’ll definitely be back next year with an even bigger Crawl!